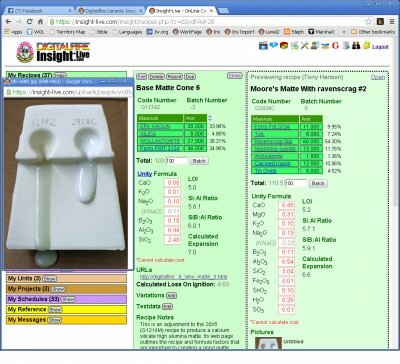 Insight-Live is an OnLine ceramic recipe, material and test results management system used by potters and ceramic engineers and technicians. It is a product of Digitalfire Corporation and has been in operation since 2012. The site builds on the traditional desktop Insight (for Windows, Linux, Macintosh) which has been used worldwide since 1980. People have private accounts or are members of a group account. They login to document their recipes, materials, firing schedules, projects, testing records and related pictures from their internet-connected devices. 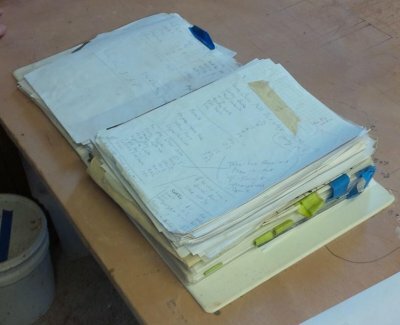 An example of a production log book that a ceramic industry worker keeps. Unfortunately, it is in his pocket, not available to lab personnel. There is room for lots of misunderstandings here. This could (should) be replaced by a group account at Insight-live.com. A cone 11 oxidation firing schedule used at Plainsman Clays (maintained in our account at insight-live.com). Using these schedules we can predict the end of a firing within 5-10 minutes at all temperatures. 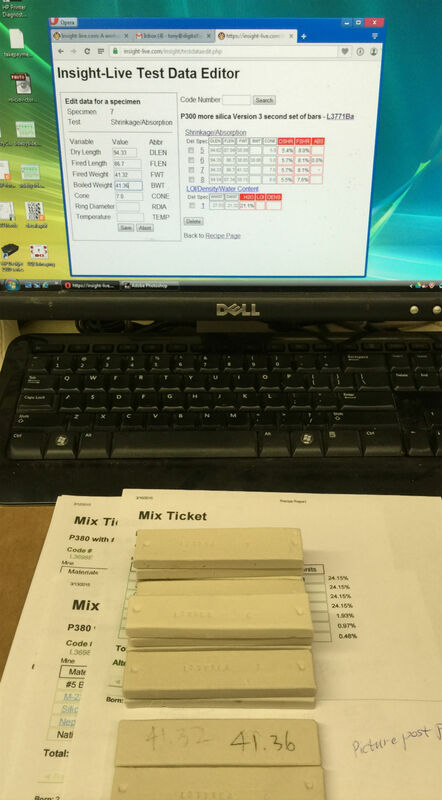 We can also link schedules to recipes and report a schedule so it can be taken to the kiln and used as a guide to enter the program. These are two cone 6 matte glazes (shown side by side in an account at Insight-live). G1214Z is high calcium and a high silica:alumina ratio (you can find more about it by googling 1214Z). It crystallizes during cooling to make the matte effect and the degree of matteness is adjustable by trimming the silica content (but notice how much it runs). The G2928C has high MgO and it produces the classic silky matte by micro-wrinkling the surface, its matteness is adjustable by trimming the calcined kaolin. CaO is a standard oxide that is in almost all glazes, 0.4 is not high for it. But you would never normally see more than 0.3 of MgO in a cone 6 glaze (if you do it will likely be unstable). The G2928C also has 5% tin, if that was not there it would be darker than the other one because Ravenscrag Slip has a little iron. This was made by recalculating the Moore's Matte recipe to use as much Ravenscrag Slip as possible yet keep the overall chemistry the same. This glaze actually has texture like a dolomite matte at cone 10R, it is great. And it has wonderful application properties. And it does not craze, on Plainsman M370 (it even survived a 300F-to-ice water IWCT test). This looks like it could be a great liner glaze. 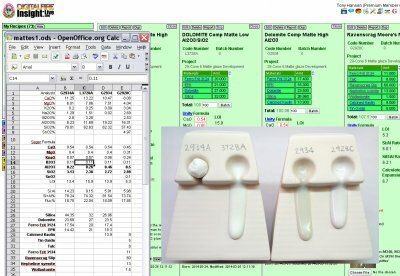 An Insight-live page displaying four cone 6 matte recipes. It has been exported to a CSV file which I have opened in my spreadsheet software. I then reorganized it to compare these 4 glazes and relate the chemistry to the melt flow tests. 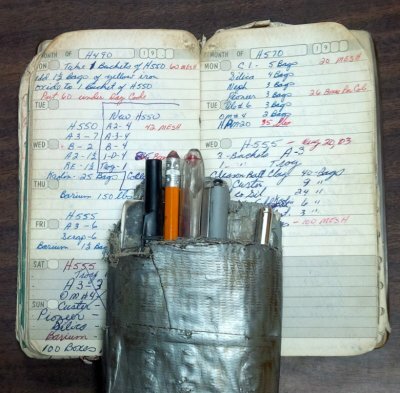 Is this your record keeping system? Keeping your valuable notes like this? Recipes? Test results? Are your pictures lost in a cellphone with no keywords or connections to anything? If you test and develop you need to organize in a way that a book cannot do. Like link recipes to each other and other things like pictures and firing schedules. You need to group test recipes in projects, classify them. Calculate chemistry and mix tickets. Research materials. Do keyword searches. Book and binder records do not do this. Your account at Insight-live.com does! Fight the glaze dragon! Test. Document. Learn. Repeat. Replace that paper notebook or binder with an account at Insight-live.com. Fix, adjust, formulate your own glaze on your PC using desktop Insight software. Fight the glaze dragon. Disorganized documentation of your testing? You are playing into his hands. Replace that notebook or binder with pictures, recipes, firing schedules, test results, material and more in your own or a group account at insight-live.com. A batch of fired test bars, organized by temperature, have already been weighed (the weight is written on the side of each bar). Now they will be measured and the SHAB test data (shrinkage/absorption) entered into each recipe record (in an account at insight-live.com). From this data Insight-live can calculate fired shrinkage and fired porosity, enabling you to compare the degree of vitrification of different materials and bodies. This is especially good for quality control purposes. About to enter boiled weight of a test bar into Testdata Editor in my insight-live account. As soon as I do that it will calculate the porosity (absorption) and show it in the ABS column (with the red title) for specimen 7. 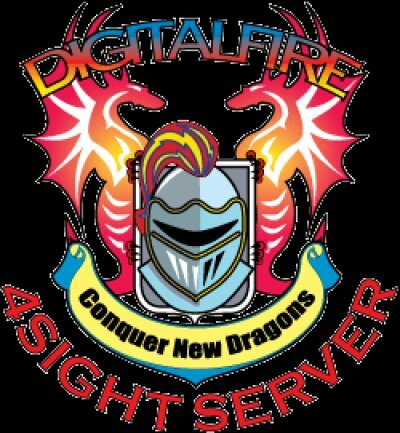 Before we developed Insight-live.com, Digitalfire introduced an online program called 4Sight Server. This was an attempt to make an online workspace behave as much as possible like Foresight for DOS. But we ran into difficulty with the complexity and decided not to proceed in about 2012, starting over from scratch to produce Insight-live.com. However, this system became our own internal authoring system for the Digitalfire Reference Library and we continue to use it. 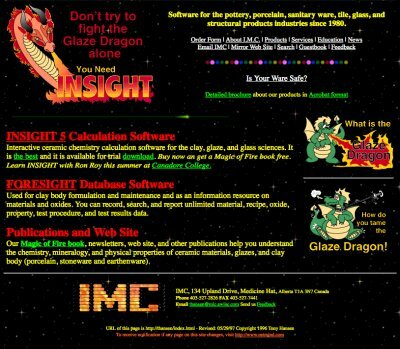 Here is what digitalfire.com looked like in 1997! We already had a large library of educational material (the predecessor of the Digitalfire Reference Library). The Foresight product was the fore-runner to insight-live.com today. And it was free like today. And we were warning people about the importance of safe glazes and understanding the "why" questions about the ceramic process. The new ceramics is about data! Everything here has a code number (in the form x1234) that members of our team can search in our group account at insight-live.com. 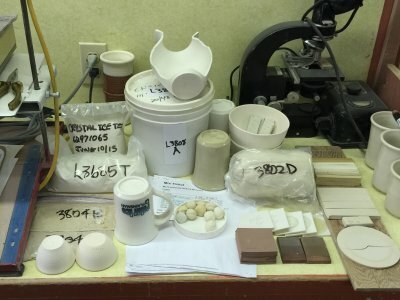 We write the numbers on the bottoms of pots, plastic bags of powders/liquids/pugged, buckets, glaze balls, mix tickets, test bars, tiles, glaze samples, drying tests, flow tests, sieve analyses, LOI/water content tests, etc. Many pots have two numbers, the body and the glaze. If something is lacking a number it goes in the garbage because it teaches nothing and is therefore taking up pointless space. Some simple equipment is all you need. It is amazing how much you can learn from characterizing a body or clay material. 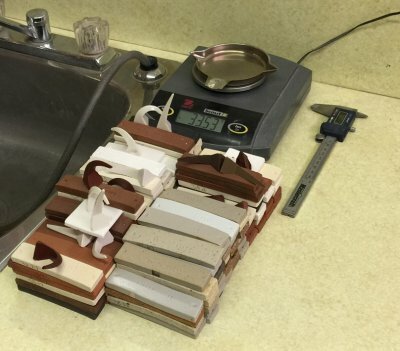 You need a gram scale accurate to 0.01 grams (very inexpensive at your ceramic supplier). A set of callipers (again, not expensive these days). 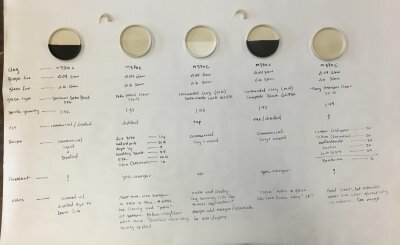 Some metal sieves (expensive, so search "Tyler Sieves" on Ebay.com). A stamp to identify samples. A plaster table or slab. A propeller mixer. And, of course, a test kiln. And you need a place to put, and learn from, all the measurement data you will be collecting. An account at insight-live.com is perfect. A potter is testing glazes on a new clay body. But this generates a lot of data, how is a person to keep track of it all? This is how we used to do it. An account at Insight-live.com is the new place to organize this. There is room for thousands, even millions of recipes, pictures, notes, firing schedules, etc. You can link them and search them in so many different ways. Testing commercial bottled glazes and glaze combination on your bodies requires good record keeping also. Pottery has always been about the data, we just let that information die before. Now we can learn so much more from it. Photo courtesy of Brielle Rovito, Burlington, Vermont, USA. 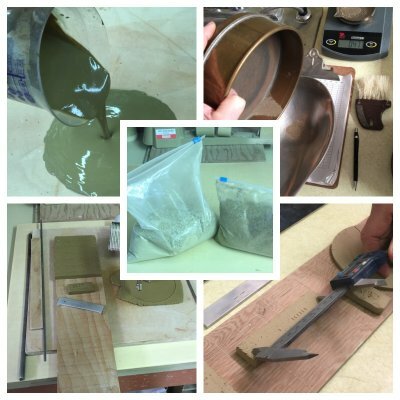 The procedure I use to record data into Insight-live from fired test bars when developing or testing clay bodies. This is the same procedure for recording numerical results from any test. A big secret to getting control of glazes is to begin looking at them as formulas of oxides rather than recipes of materials.